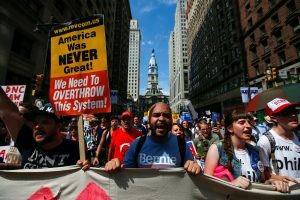 PHILADELPHIA — Chanting “We are the 99 percent,” about 100 Bernie Sanders supporters began marching across a bridge from New Jersey into Philadelphia in the sweltering heat Monday ahead of the opening of the Democratic convention. The demonstrators on the Ben Franklin Bridge planned to link up with hundreds more gathered at Philadelphia City Hall, and together march 4 miles down Broad Street to the arena where the convention was to set begin in the afternoon. The protests took shape amid a punishing heat wave, with forecasters saying the temperature could hit 97 degrees and feel like 105. Volunteers will be handing out water, and the city will provide misting tents for demonstrators all week. Protesters also lined up hundreds of spray bottles to keep marchers cool and planned to make tubs of ice and towels available too. Gary Frazier, a Camden resident and organizer with Black Men for Bernie, said the goal is to get the convention to nominate Sanders for president. If that doesn’t happen, he said, there will be a push to withdraw Sanders supporters from the Democratic Party. He said a Donald Trump presidency wouldn’t be any worse than what’s happening now. Although planned for months, the marches came as fissures widened in the party despite weeks of effort to make a show of unity. Debbie Wasserman Schultz resigned Sunday as Democratic Party chairwoman over leaked emails suggesting the supposedly neutral DNC had played favorites for Hillary Clinton during the primaries. The emails angered many Sanders supporters. Philadelphia Police Commissioner Richard Ross was again on scene of the protests Monday, watching as he did on Sunday as officers directed traffic and kept protesters confined to the sidewalks. Ross said that Sunday’s marches were “like a scrimmage game” and that while the protests will only get bigger, he was pleased with how respectful the demonstrators have been. The four-day convention is being held at the Wells Fargo Center in south Philadelphia, well removed from City Hall and the skyscrapers of Center City. By contrast, the Republican convention last week in Cleveland was held in a bustling part of the city. A heavy police presence and fewer than expected protesters helped authorities maintain order. Only about two dozen arrests were made. Sanders supporter Jeph Witters, 31, came to Philadelphia from Detroit, arriving Sunday after a 12-hour drive. He planned to march Monday from City Hall to the convention site.